As the first year of continuousWave's Classic Whaler website draws to a close, we'll wrap up with a few presents sent in by some of our many visitors during the past few months. As we recently learned in the Whaler Voting Booth, the 16/17 foot hull seems to be the most popular. It is a great boat. It's easily trailered, yet it is big enough to get you out on the water--even on the ocean! These Whale(r)s roam far and wide across North America. From their initial introduction into American waters in Massachusetts, the 16/17 Whale(r) has spread all across the continent, including an impressive northern migration. 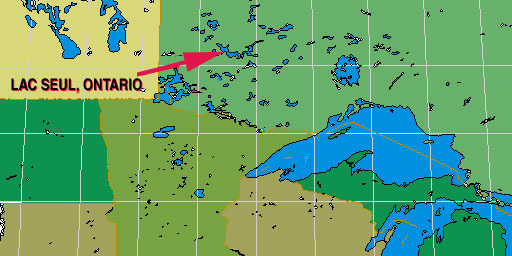 Cetologist Ron Machtan has traveled with his Classic Boston Whaler Nauset north of 51° Latitude, to visit Lac Seul, a sprawling wilderness lake with over 1,000 miles of shoreline and a breadth of about 100 miles. We see how the classic Whaler assimilates on these northern waters. Staying with the 16/17 foot theme, Al Seymour and Bill Allard also sent some nice shots of their classic, blue interior boats, now enjoying the easy life of summer on northeastern inland lakes. 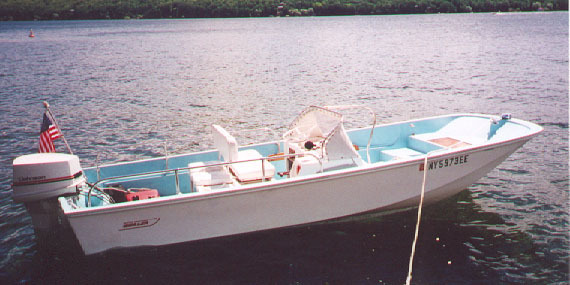 And David Livingstone, of true "down-east" Prince Edward Island, sent some photos of his classic 16-footer, which, if it had an interior, would also be blue! "I am e-mailing some photos of my 1967 Nauset MASTER BAITER in action on Lac Seul, Ontario, Canada from August, 2000. This was her second trip to the wilderness of Northwestern Ontario. 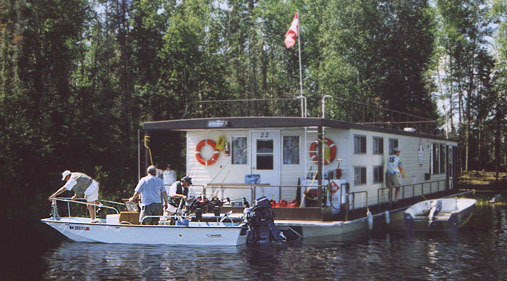 We live aboard a 75-foot luxurious houseboat from Lac Seul Floating Lodges of Hudson, Ontario. From Hudson, our able captains Jim Brown Sr. and Jr. pilot us some 70 to 80 miles into the back country. They have been doing these trips twice a year for twenty odd years and know the lake and bays exceptionally well. "Like any huge resorvoir lake in the wilderness, Lac Seul can be fickle. One morning we might awake to dead calm and warm, the next, it is windy and wavy, and screw-loosening! 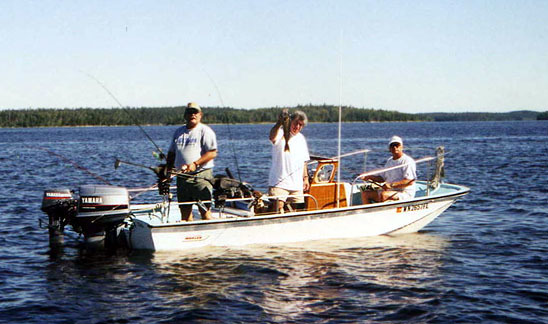 Lac Seul is well known for its great walleye and muskie fishing, and it's the walleye that attracts us each year. "The photos are indicitave of the type of weather we prefer, but seldom get. Enough wind to accomodate a gentle drift, but warm enough for shorts and T-shirts. Note the drift sock deployed to control our broadside drift accross fish holding structure. Accompanying me (with fish) is Ron Hubbard, (aka Big Dog), Kenosha, WI. "The next two photos will be similar in nature, with one showing the kicker motor in "working" position, the other giving a glimpse of our 'mother-ship'. "If you can use the photos in Cetacea, please do. In the meantime I wish you well and again offer my congratulations on a fine and worthwhile site. The proof is in its own growth and the networking that has taken place over the past months that I have been logging on. I have had more people contact me for information about my boats and they are always respectful and courteous. I think this says something about the kind of people who appreciate quality boats." In remote northwestern Ontario, Lac Seul is a fisherman's paradise. It is about as far from Toronto as Jacksonville, Florida! The 16-foot Nauset has a 90-HP Yamaha and an auxillary trolling engine, two big down riggers, and two guys (who look like they used to play for the Packers) aboard, yet she still looks stable and roomy. Ron "Big Dog" Hubbard shows us a Walleye. Even with three adults aboard--and plenty of fishing gear-- the old Nauset sits trim and even on her classic lines. 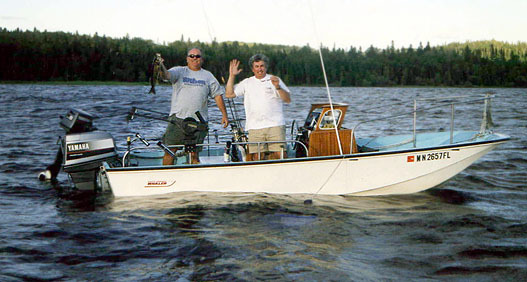 Lac Seul serves up another of her famous Walleye for Ron. Fifty miles out into the wilderness of the lake, a 75-foot houseboat makes a comfortable base of operation. You can come back, tie up your Classic Whaler, cook all those fish you caught for dinner, and maybe have a few Canadian barley sodas. That Nauset looks a little more stable than the aluminum fishing boat alongside. If you're out on a big lake and 50 (or more) miles from rustic civilization the safety of a Whaler is a big plus. 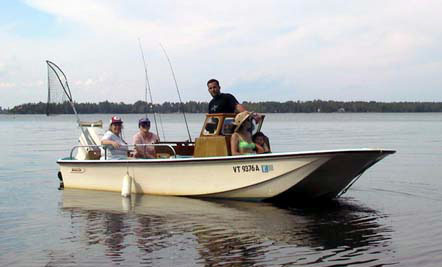 "I bought my 1971 Whaler used in 1981 for $2,500, boat, motor, and trailer. All is original, except the bow light. I have the bow rails in storage, ready to mount when I find a new bow light. "I replaced the original motor in 1986 with a 90 HP Johnson. I replaced the white rub rail (thanks to Jim Knight at Classic Whaler) last summer. "The original owner was the Ford family, who used the boat at their summer island home off the Maine coast. 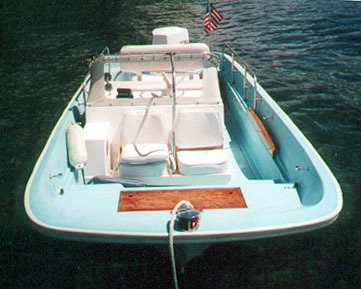 "The Katama model --16' 7" length-- was made from 1968 to 1975 and has a fiberglass console and windshield attached to the starboard side. "I have it at our summer home on Canandaigua Lake (a NY Finger Lake) for the last twenty years and plan on another twenty!" The canvas weather cloth wind and spray shield and the molded console are features which identify the Katama model. Lake Canandaigua looks like a great home for this classic. The white rub rail preserves the traditional appearance. And the white outboard maintains that same theme. The console is offset to starboard, which probably helps counteract the propellor torque when underway with just one person aboard. The forward seats are on centerline. 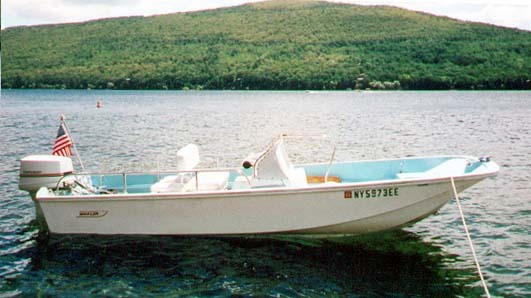 "I have enjoyed the classic whaler website and felt I should share a picture of our old Eastport model. The serial number is 30890. I acquired it about twenty years ago from the son of the original owner. It was used by their family to go to their property on Isle Au Haut in Maine, then was later moved to Lake Champlain. "The boat originally had a Bimini top and a spray shield over the bow. There where also some mahogany side pieces along the rails. We discarded the canvas, which was in poor shape. The original Johnson 60-HP has been replaced by a Johnson 48. This is plenty of horsepower for the current uses, mainly fishing and sightseeing. "When we got it the hull had a few minor dings. We filled them with fiberglass and repainted the exterior. The wood finish requires annual maintenance with varnish. We tried an oil finish and it didn't work well. The wood is beginning to show some dry rot, but it certainly is remarkable that this boat has been in service since 1962 without any major disaster." The addition of a rear bench seat turned a Nauset into an Eastport. The fishing is about to begin on this Vermont lake. This Eastport has nicely curved lines in her bow. "Hello Jim, I am sure that I am not the first nor will I be the last, but I'd just like to thank you for the great job that you are doing on Classic Whaler. "I have attached a couple pictures that may encourage others (with a little and sometimes a lot of work) to become a Classic Whaler owner, too. 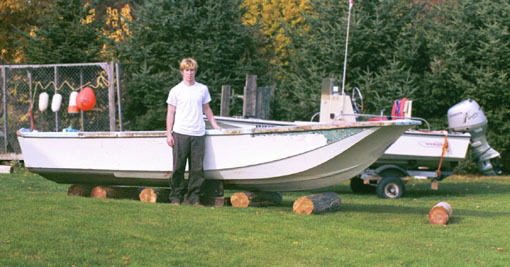 "The first picture shows my 16-year-old son, Colin, standing in front of my 2000/2001 winter project. As far as I can tell, the boat is a 16-foot Whaler that is pre-1972. There is no hull number on it due to the layers of paint, and I think it was also regelcoated. In the background is my 15'3" 1983 custom centre console with a 45 HP Honda. That boat I bought two years ago and fixed it up the same winter. At the time it was full of patchs, no rub rail, no windshield, no seat, etc. That little boat has worked so well that I had to turn down buying a 22-Revenge, because no one in the family, including myself, wanted to part with the 15-footer. 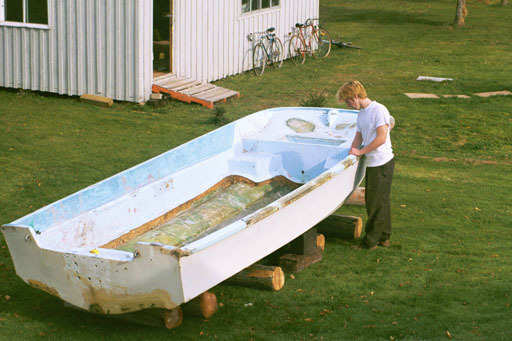 The second picture is another shot of the old 16-foot hull, and, yes, it has no floor in it! The dive shop that I bought it from was still using it as a work boat. They had reinforced the inside of the hull, but as you can see it still needs a lot of work. "Thanks Jim once again for making a long Canadian winter a little shorter, David Livingstone, Prince Edward Island, 2000 miles north of Florida but on the same coast!" Since this 16-foot hull lacks the "smirk" bow, it must date from before 1972. Notice the keel-roller style "trailer" the boat is sitting on. From the look of this hull, David and his son Colin will have plenty of work to keep them busy this winter! There you have it: four Classic Whaler 16-footers! It is great to see these older, blue-interior boats still looking good and providing their owners with continued good service.